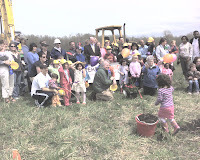 Amara's school held a ceremonial groundbreaking to celebrate their new building. The morning was chilly, following bouts of on-and-off rain for hours. Needless to say, I wasn't looking forward to trudging through muddy fields. But the rain held off. And dozens of kids joined Teacher2Amara at the construction site. 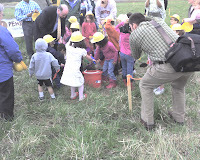 First the kids were invited to put on a hard hat, take a shovel, and sweep up potting soil break ground. They even managed to pose for pictures and release some balloons. Between this, taking Aunt and Uncle2Amara to the airport to see the Mouse, Amara's dance class, and taking Bean to a friend's birthday party, I'm exhausted. I'm going to take a nap. Want to know what's going on with Amara's new house? 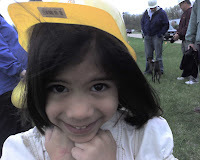 Follow the cute girl in the hard hat.